Tired of the wear and tear feel of conventional makeup but still want to jazz up your look and feel good doing it? Our Organic Make-up Set is here! Control shine or prime with our top rated organic mineral free Petal Translucent Powder💐, spark up your eyes with our organic Coconut Eyeliner 🌱and fan favorite organic Herb /Henna mascara, Dab a little organic Root Lip Stain 🌸for your pout and top off your cheeks with our organic Petal Powder Blush🌺. Dab Herb Make-up and Skincare products are free of animal testing and have been tried and perfected by yours truly. We at DAB love our products and use them routinely, so in an effort to provide the best and purest botanical cosmetics, we developed this set specifically for YOU! All products included in this set are handmade from organic ingredients (95% certified organic, 5% wild crafted, food grade and GMO free). This listing comes with a cotton pouch bag with cotton drawstrings. Message DAB Herb Make-up to let us know if you prefer black or brown eyeliner or mascara. DAB Herb Make-up hand makes all products from scratch and is a member of Truth in Labeling. Our mission is to provide safer products to enhance a woman’s natural beauty while also giving her peace of mind. DAB Herb Make-up accepts no liability and shall not be held responsible for any injuries, damages, or losses resulting from the use of products purchased from this shop. Purchasing shop products signifies your acceptance of this statement and releases DAB Herb Make-up from all liability. Just as described. Very light coverage sheer powder smells great, perfect color blush, love the mascara sample size, need to order full size when it runs out. Great black eyeliner too. Most of all... LOVE the lip stain. 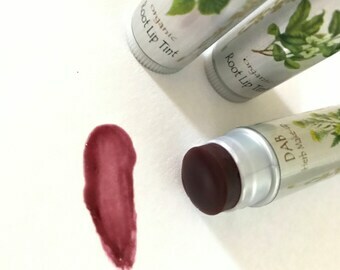 Like a lip gloss that dries shiny and keeps your lips moist and lightly stains them, it's the best lip product ever!! I like to use things for awhile before reviewing. These items passed with flying colors. This kit has simplified my entire makeup routine, for the better. I work with birds and reptiles, so chemical filled makeup and crap can potentially make them very sick, so I went on a life purge and went simple and natural with everything! The powder was a great match, and I felt like I wasn't wearing anything on my face, at all! Which is a big one, because I cannot stand cakey makeup. If you're super pale, like I am, be careful with the blush, and built up instead of doing too dark, at once. The lip stain is beautiful, and I'm not a lipstick type person, at all. Now, the only issue I have had is with the mascara. I'm so used to the waterproof drugstore brands, but it's not a bad thing. Just getting used to the transition into natural makeup! Thank you! You guys rock! I love this makeup! It definitely gives a more natural look, but thats what I have been trying to get back to. I have very sensitive dry skin and i have had zero irritation with this makeup. I cannot stand the feeling of other makeup brands on my face as it feels like cakey mud, but this makeup feels amazing on my skin! ​Given the artisanal and sensitive nature of our creations, we do not offer exchanges or returns for reasons of general dissatisfaction on used products. Each and every one of our creations are handmade and hand-poured with utmost care and, for safety reasons, we refrain from restocking, reselling, or accepting used items. Please connect with us prior to ordering if you are in need of a beauty and wellness consult or refer to our FAQ section. Please note that most items have sample sizes available for purchase. For those that do not have samples for sale, we happily include one sample of any product on every purchase. Please indicate your request in the “notes” section during checkout and we will be gladly include a sample of your choice- or one of ours if you have no such preferences. IMPORTANT : Shipping time is separate from processing time. Processing takes a standard 3-5 days prior to shipping. We use USPS First Class Mail which estimates 3-8 days until delivery. Priority Mail upgrades can be purchased along with your items and estimates 1-4 days until delivery. With our method of shipment, US residents will automatically receive a tracking number prior to the package being mailed. Orders are processed and shipped within 3-5 business days throughout the year except for the holidays. Holiday shipping adjustments are announced online throughout our social media platforms. Customers with International orders are responsible for their country's laws on customs fees, taxes, etc. and Dab Herb Makeup and Skin Care will not be held responsible for these incurred fees. NOTE : Dab Herb Makeup and Skin Care is no longer responsible for your package after it is shipped. We provide a tracking number after your purchase (via email). We suggest to watch your package closely to prevent your package from getting lost or stolen. Send us an email if your item is not received in 10 days and our customer service representatives should be able to guide you through the appropriate course of action. *** We reserve the right to refuse service to anyone for any reason at any time. ***We reply to emails within 3 days. Thank you for your patience and understanding. ***We welcome Wholesale Orders and Private Labeling . ***Customers outside U.S. are welcome to purchase. Just send us a message so we can discuss shipping cost. 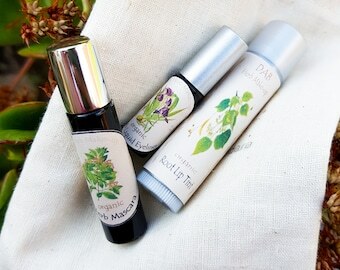 Whats the difference between Dab Herb Makeup and Skin Care and other natural products? Let's start with stating that "natural" is an umbrella term for a lot of things. Natural makeup isn't necessarily organic. Minerals are natural, for one, but they definitely aren't organic. That's a term the USDA grants to food-grade and plant based ingredients if they meet the same strict farming and processing regulations. Now, for the FDA to even allow a brand to label themselves "organic" their ingredients have to be at least 85% plant based. Our ingredients for Dab's makeup line alone is between 90-100% plant based. 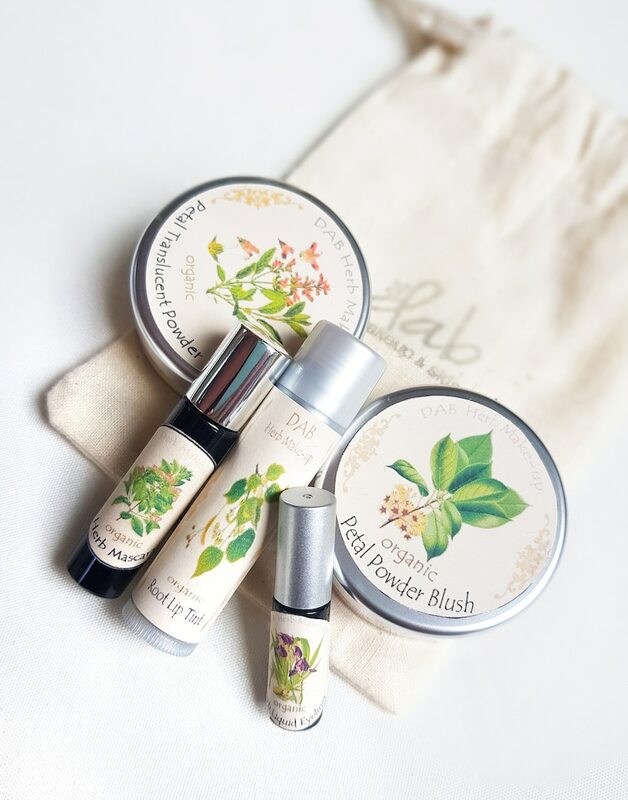 Dab Herb Makeup and Skin Care (lovingly shortened to Dab) gives you thoughtfully made and carefully packaged organic makeup and skin care straight from our lab to your doorstep. Are your ingredients and products vegan and cruelty free? They most definitely are. Dab is invested in vegan, cruelty free, and fair trade practices. I'm allergic to an ingredient you use in a product I want to buy. Can it be replaced? Feel free to inform us about anything we can help you with- especially any allergies! Send us a message to talk specifics. Dab definitely caters to any customization wants and needs for a reasonable fee. Send us a message to talk specifics. When available, we also make it a point to include a sample of a random product from our store with your every purchase. Feel free to make a request if you've been eyeing anything in particular. Do you sell bigger sizes? Unlike conventional makeup, our products make use of organic (plant-based) preservatives, and even then we try to make use of as little preservatives as possible (some of our products don't even contain them) to make sure that your makeup and skin care essentials remain as pure as we can make it. We keep our packaging small in order to prevent waste and encourage everyday use for optimal healing benefits. Remember, Dab uses the purest USDA approved organic ingredients. Everything food grade, vegan, and cruelty free- oh, and most definitely made fresh just for you. How do I know when my Dab products have expired? When do I replace them? Depending on the product, you can find the period-after-opening symbol (PAO) at the back or the edges of our skin care and makeup labels. What is the shelf life of unopened Dab products? Unopened, our makeup and skin care should be able to last between 6-8 months. Please make sure to store them tightly and away from humid places. Why do you hardly use mineral ingredients? We pride ourselves on providing makeup and skin care that is as purely organic as we can make it. We keep the use of minerals in our products as minimal as possible to make use of the healing benefits of plants and avoid any contaminants that can be found in mineral ingredients. How do I apply Dab products? We highly recommend using your fingers for applying our cream makeup products. Using your fingers provides a more precise and sleek application and the warmth of your fingers help your skin absorb the nutrients of the makeup better. As for the loose powder products, you could always choose to use a brush to really pack in that color and ensure precision. Going off of the principle that oil repels water, we could say that most of our products- especially those that contain essential oils- are pretty water resistant. Just don't go jumping into any pools, honey! How long do the herbs usually infuse before the oils are ready to be used in makeup? We leave our infusions out for 2-3 weeks with regular agitations to make sure that our oils are packed with all the good stuff for you. Can I wear your makeup to sleep? In theory, our makeup should be safe for your skin to wear over night, BUT as nourishing as our makeup can be, we have to consider the layer of dirt that our long days leave on our faces all the time. We'd recommend always cleaning your face before bed, hon. Thankfully, Dab is incredibly easy to remove and would make your nightly routine all the more easier. How come the color of my product changed from the last time I ordered the same thing? Please expect slight variations in some of our products since we use plant pigments instead of artificial colorants. The quality and pigmentation of our plants and herbs very from season to season. What if my products melt? What if they're frozen? The organic nature of our skin care and makeup make them highly susceptible to temperature. If your product melts in the heat, simply pop it in the refrigerator for a few minutes before use. "Frozen" products can be thawed by rubbing your finger tips onto the product to warm it with your body heat. Alternatively, 5-7 second under your hair dryer's low heat setting should do the trick for a quick fix in really cold weather. My package was lost in the mail. Now what? If after 7 business days your order hasn't arrived, we advise you to approach your courier (USPS) through their website or over the phone to have them track down your package. As a customer, it is your prerogative to file a lost mail search for delayed or missing packages. By accessing this website we assume you accept these terms and conditions in full. Do not continue to use Dab Herb Makeup and Skin Care's website if you do not accept all of the terms and conditions stated on this page. Unless otherwise stated, Dab Herb Makeup and Skin Care and/or its licencors own the intellectual property rights for all material on Dab Herb Makeup and Skin Care. All intellectual property rights are reserved. You may view and/or print pages from https://www.etsy.com/shop/DabHerbMakeup for your own personal use subject to restrictions set in these terms and conditions. Redistribute content from Dab Herb Makeup and Skin Care (unless content is specifically made for redistribution). We reserve the right at any time and in its sole discretion to refuse service to anyone. We reply to emails within 3 days. Thank you for your patience and understanding. We welcome Wholesale Orders and Private Labeling . Customers outside U.S. are welcome to purchase. Just send us a message so we can discuss shipping cost. This Terms and conditions page was created at termsandconditionstemplate.com generator. If you have any queries regarding any of our terms, please contact us though our mailing address or through our contact form found on the Connect page of this Website.